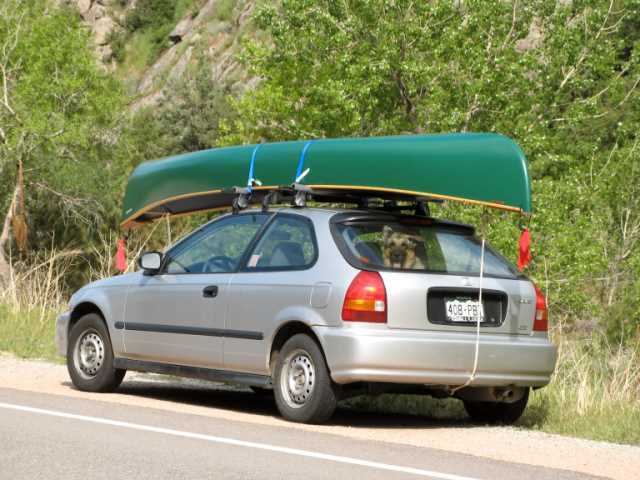 My little car doing a big job: hauling Cora and a canoe. We sold my old car last week, and it was a more emotional event than I expected. In general, I’m not that sentimental about cars. I don’t name them, like some of my friends do. I don’t care what color they are, as long as they aren’t something truly atrocious. I want reliable transport, bonus if it’s comfortable. Any extras are just that — extra — and they don’t really matter. Does it go down the road without breaking down? Will it get me and my stuff where I want to go? Does it get decent miles per gallon? These are my main concerns. But my silver 1996 Honda Civic hatchback was a little different. It’s the first car I ever bought, and I did it all by myself. I stood my ground with the dealer when he tried to push extra warranties on me, took out a loan without any financial help, and paid it off in a timely fashion with my own hard-earned money. Until that point, all my cars had been family hand-me-downs. I might have paid some money for them, but it hardly counted as the true adult experience of buying a car. I was proud of myself for getting the job done. My Honda was already seven years old when I bought it in 2003 and the car fit me well. A hatchback was ideal because my German Shepherd Cora could ride in the way back pretty comfortably. Even after I got married again and we had two cars, the Civic was our “dog car”, for taking Cora into the mountains to hike or to the vet for her shots. That car has plenty of life left in it. 17 years and 108,000 miles is nothing in Honda years and Honda miles. The only problem with it was its size. My husband is nearly 6′ 4″ and he could only sit in the Honda by tilting his seat back — way back. So I’ve been expecting this day for six years. The Honda was great when it was just me and the dog, but every time I saw Kurt get in that car, I cringed. I’m happy to say the Honda has gone on to another owner, instead of where I feared it was headed, some junk yard to be dismantled for parts, or worse, turned into scrap. The new owner believes in driving his cars into the ground, so I expect the Civic will be on the road for another 100,000 miles if not more. It takes a little of the sting out of saying good-bye to this car which I associate with a time in my life when I was making it on my own. I realize now that my Honda was a symbol of my independence, which fed my fantasy of myself as a self-sufficient woman who requires help from no one. I realize now self-sufficiency is an illusion. I need other people to survive in this world, whether they are growing the food I eat, providing me with work and a paycheck, or giving me the medical care I need to stay well. Letting go of the Honda meant letting go — at least a little — of my ideal of self-sufficiency.